HSU, APRIL 1 – Good, clean fun? Or bizarre costume fetish? There’s plenty of Middle-Earth, but no middle ground for opinion when it comes to Humboldt State University President Rollin Richmond’s participation in the Hobbit recreation fandom community. Campus eyebrows were raised last week when Richmond appeared at a university board meeting wearing a full beard, hairy, bare feet and a cape. Sources say that after the meeting, Richmond was seen playing a wooden flute while sunning himself beside a small stream. Sir Rollin of the Shire. Popularized by J.R.R. 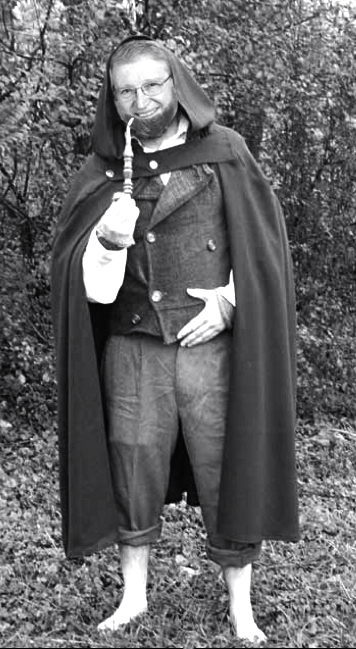 Tolkien’s Lord of the Rings fantasy franchise, fans of Hobbit recreation favor a natural look, including rolled-up cotton pants, wool vests and hooded cloaks. Some members are known to carry a wooden staff for enhanced balance and personal protection. While most enthusiasts are thought to delve into the Hobbit recreation community only during conventions and special gatherings, sources say that Richmond has adopted the lifestyle full-time. “He doesn’t seem to be hurting anyone,” said HSU Provost Robert A. Snyder. “There’s no campus policy against napping on his office floor, falconry or cleaning his toenails in the drinking fountain. “Lord knows we have our share of pipe smokers around here,” Snyder continued, shrugging off Richmond’s eccentric new lifestyle. What began as infrequent escapism — friends say Richmond’s hobby started with a chance visit to HobbitCon – has morphed into a committed way of life. Some campus observers don’t see any problem with that. Some recent decisions out of Richmond’s office have come under official scrutiny. A presidential edict issued last month requires all building entrances to be replaced with round doors. Telephone and fibre-optic cables have been removed campus-wide, in favor of a flock of messenger-hawks. Campus press releases are now hand-inscribed with a quill pen on parchment and read aloud with a flourish of trumpets. An incident last month in which witnesses observed Richmond using a slingshot to kill a small rabbit – which he then reportedly field dressed, filleted and roasted over a small campfire on the campus quad – is under investigation. This entry was posted on Sunday, April 1st, 2012 at 9:30 am	and is filed under News. You can follow any responses to this entry through the RSS 2.0 feed.